For those who’ve never attempted sourdough bread before, or simply dabbled in bread baking. Taught by Celine Underwood, founding baker at Brickmaiden Breads. What is sourdough culture? What is gluten? What makes a successful & beautiful loaf of bread? Through conversation and hands on experience you will become acquainted with the art of sourdough baking. You will cultivate your own natural starters and we will discuss their care. You will be introduced to hand mixing & forming loaves, helpful materials and tips for a satisfying home bake, & a recipe to take home. Attendees will take home starter, pizza dough & fresh loaves of bread. Morning coffee/tea & scones, and light lunch is included. Click here for more information, or to register. This is an in depth workshop for those who currently bake and would like to further develop their skills. Taught by Celine Underwood. 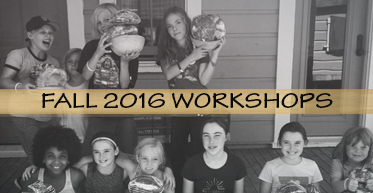 In this workshop you will be introduced to baker’s percentage & building bread formulas. We will discuss and work with both whole grain and sifted flour, playing with different hydration levels. We will mix, form & bake our loaves. Attendees will take home their freshly baked bread, as well as recipes for home. This is a playful in depth workshop for those who currently bake and are comfortable with the process but would like to further develop their skills. Taught by Celine Underwood. In this workshop we will mill our own flour, experiment with different fermentation schedules and starter percentages. We will work with a variety of grains and dough, play with high hydration forming technique, stencil design, variations on scoring & other artistic endeavors. Attendees will take home their freshly baked bread. Kids will enjoy a day of cracker and cookie making. They will mix, roll, cut and bake their own crackers and cookies, bringing home inspiration and excitement to make them for their families over the holidays. recipes and fresh baked goodies included!